Crabapple trees are a popular choice of ornamental tree, due to their pretty spring blooms and the fact that many stay relatively small, even at maturity. Due to improvements in breeding, newer varieties are healthier, hardier, and more lovely than ever. In this blog, we will highlight both traditional and newer varieties that we feel are hardy and low-maintenance choices for our zone and the climate conditions of Northern Illinois. These spring blooming ornamental trees come in a variety of color combinations in the blooms and foliage, as well as a variety of sizes and shapes. There is a perfect crabapple tree for every landscape. We select all of our crabapples for disease resistance and persistent fruit (hangs onto the tree). Coralburst - This variety is a true dwarf variety and is ideal for use as an accent in the garden, as a small anchor on the end of a planting bed, or at the corner of the home or patio. It is very compact, slow growing and will rarely require pruning. Dark green foliage and bright pink, double-blooms in the spring. Cardinal - The Cardinal Crabapple has a wide canopy, that can double it's height. At maturity, this variety will be about 25' wide by 12' tall. This is a highly disease resistant variety with larger dark purple leaves and bright magenta blooms and it is also known for pretty orange and yellow fall color. Firebird - Reaching just 8 feet tall at maturity, this dwarf ornamental is known for its clusters of bright white blooms in the spring, which contrast with the deep dark foliage. This variety has a very heavy fruit set of gorgeous 1/2" red crabapples, but the fruit persists over the winter so no need to worry about a mess. Prairiefire -The Prairifire Crabapple is a top seller, due to it's nice shape and size, which is about 20' by 20' at maturity. This variety is a classic bright magenta bloomer that announces "spring has arrived" when the buds pop every year. Red Jewel The Red Jewel Crabapple is a real gem of a plant. The small size make it a perfect accent tree and the year round interest is hard to beat. Bright white flowers bloom each spring and the persistent bright red berries look beautiful and seasonal throughout the summer, fall and winter . Ruby Dayze (New!) - This is a new, more upright and columnar crabapple with pink flowers and deep purple foliage. The tight oval shape makes this crabapple ideal for a street tree and it is also very low maintenance and incredibly disease resistant. Royal Raindrops - We're a huge fan of this tree, and many of us have one in our own landscaping. Fragrant rose flowers appear along the branches in mid spring before the leaves. It has attractive deep purple foliage throughout the season, that turns deep red in the fall. 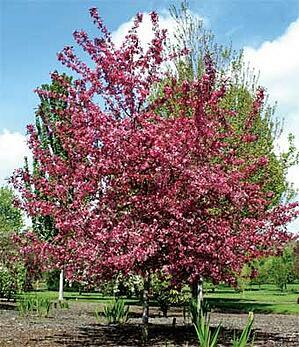 Sargent Tina - This is one of the most enduring and popular dwarf ornamental crabapples. It is smothered in fragrant pink flowers in spring followed by red fruit in fall. The artistic, horizontal branching makes it an interesting addition to the landscape. Sparkling Sprite - This tiny, lollipop shaped crabapple is slightly larger than the Coralburst, and will reach about 12' by 12' at maturity. The buds are pink and open into white blooms, with bright green foliage and a yellow to orange fruit that looks so pretty well into winter.